PETALING JAYA: Glomac Bhd is optimistic about achieving another financial year of record-breaking new property sales. For its financial year ended April 30, 2012, the property developer had chalked up record sales of RM663mil. FD Iskandar says Glomac is on track to achieve its target of record sales. Glomac has a pipeline of future projects with a total gross development value (GDV) of RM7bil, out of which RM1.13bil is targeted to be launched in financial year 2013. “Usually, we hit 80%-85% (sales of the new property launches). So, I think we should have at least RM800mil of sales in financial year 2013,” said Glomac group managing director and chief executive officer Datuk FD Iskandar. 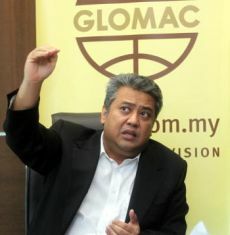 He told StarBiz that Glomac was on track to achieve its target as it had achieved new sales of RM212mil for its first quarter ended July 31, 2012. Key drivers for the group's sales in financial year 2013 will be Lakeside Residences in Puchong, Phase 4 of Plaza Kelana Jaya, and the townships of Bandar Saujana Utama and Saujana Rawang. It should be noted that for 2012, Glomac had posted record revenue of RM652.4mil (increase of 9.2% year-on-year) and net profit of RM85.2mil (increase of 35.2% year-on-year), which was mainly due to key projects such as Glomac Damansara and Glomac Cyberjaya 2 as well as the final billings from the completed Glomac Tower. For its first quarter ended July 31, 2012, Glomac had posted a a 17.3% year-on-year increase in net profit to RM21mil, while revenue rose 26.1% to RM161.1mil. He also said launches of the group's townships had enjoyed positive responses mainly due to the good mix of affordable and mid-market landed properties. There are also plans for residential development over 200 acres in Sungai Buloh, which is next to the group's Bandar Saujana Utama development, and 191 acres in Dengkil, Sepang to tap demand from middle-income home buyers. Both parcels are expected to have a GDV of RM800mil each. It was also noted that the recent launch of 105 units of two-storey terrace houses with GDV of RM75mil at the group's Lakeside Residences development in Puchong, Selangor was fully sold through balloting. Lakeside Residences is a mixed development with a GDV of RM2bil, and plans for about 6,000 residential units to be launched within the next six years.